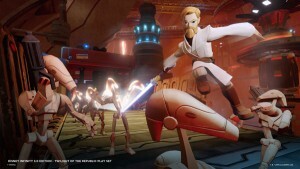 [su_lightbox type=”image” src=”https://www.keenandgraev.com/wp-content/uploads/2015/09/Geonosis-Factory.jpg” class=”pointer”] [/su_lightbox]Twilight of the Republic takes place chronologically between the second and third movies smack dab in the middle of the Clone Wars era. The basic story (no spoilers) has you traveling through various planets to identify a new threat to the Republic. This threat will introduce you to familiar locations such as Geonosis and Tatooine, as well as many legendary figures from the entire Star Wars series. While the story is good, there are definitely some liberties taken. As long as you’re not a purist you should be fine. My only true critique is that I wish it was longer. 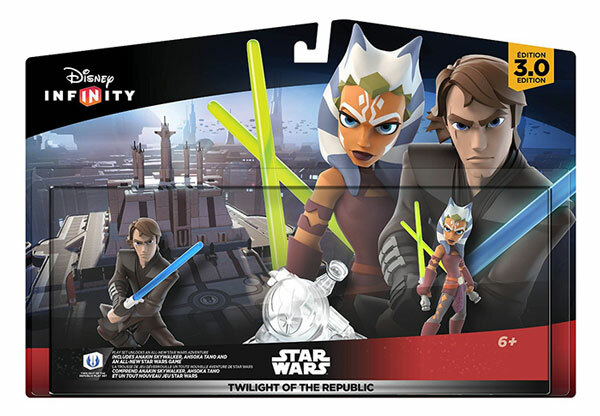 The play set comes with Anakin Skywalker and Ahsoka Tano. Combined with Yoda and Obi-wan (with Darth Maul release later this year) these are the only current characters you’ll be able to play in TotR until you unlock more character tokens — you’ll still need to purchase those characters to use them as well. For the purpose of scoring this review, I am only going to review what is included in the play set. Anakin and Ahsoka both have their own skill trees to advance, but in the end they are both lightsaber wielding Jedi with over-the-top Jedi powers. Anakin’s special has him ripping up pieces of the terrain and Ahsoka can throw her lightsaber. Both can force jump, and Ahsoka will push where Anakin pulls. I found Ahsoka’s speed to be quite useful, but in the end nothing seemed to match up to Anakin’s raw power. Overall, both are great characters and I’m glad these two came in TotR. However, if you just have these two characters then you may find yourself wanting. I definitely recommend you pick up another character or two. 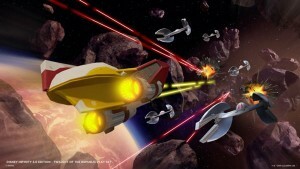 [su_lightbox type=”image” src=”https://www.keenandgraev.com/wp-content/uploads/2015/09/totr-space-combat.jpg” class=”pointer”] [/su_lightbox]One of the more thrilling aspects of the game will be when you enter space for the first time and realize it’s way more open than you’d expect. Granted, it’s not huge and you’ll eventually feel restricted, it’s not on rails. You’ll dog fight with droid ships, land on Mario Galaxy style planetoids, and spend way too much time searching to Mynock to collect. I think vehicles in general were well done. Even the podracing event (see my video below) was neat and definitely frustratingly difficult. I am either terrible at driving these vehicles, or there’s something else wrong. Overall, I had a blast playing Twilight of the Republic. At times it felt overly simple and definitely aimed at children, but then at other points I kept thinking to myself there’s no way a kid is going to beat this part. I liked the story despite its liberties taken, and simply wish it was longer. Each planet was fun and memorable, but again I wish there would have been more of them or at least more to them. 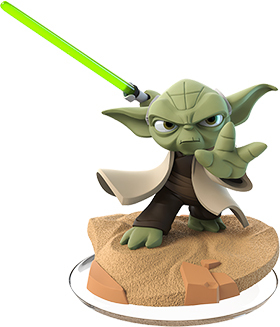 TotR was a great start to my Disney Infinity 3.0 adventure. Next up: Rise Against the Empire!